Paul Klee was one of the greatest colorists in the story of painting, and a skilled deployer of line. His gravest pictures may have an undercurrent of humor, and his powers of formal invention seem infinite. After making an early choice whether to pursue painting or music as a career, he became one of the most poetic and inventive of modern artists. He taught at the Bauhaus in Weimar and Dessau and then at the DЭsseldorf Academy. Until his expulsion from DЭsseldorf by the Nazis, Klee painted and drew on a very small scale, yet the small size of his pictures does not affect their internal greatness. The Golden Fish glides through the kingdom of its underwater freedom, all lesser fish leaving a clear space for its gleaming body. This is a magical fish with runic signs upon his body, scarlet fins, and a great pink flower of an eye. He hangs majestically in the deep, dark blue magic of the sea, which is luminous with secret images of fertility. The great fish draws the mysteriousness of his secret world into significance. We may not understand the significance, but it is there. The sea and its creatures are arranged in glorious homage, belittled but also magnified by this bright presence. This quiet nobility, the brightness, the solitude, the general respect: all are true of Klee himself. 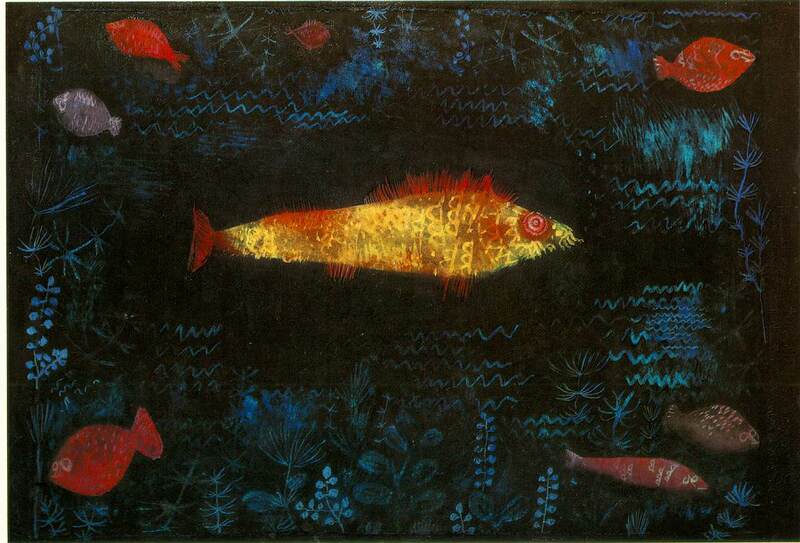 Whether the art world knew it or not, he was their ``golden fish''.